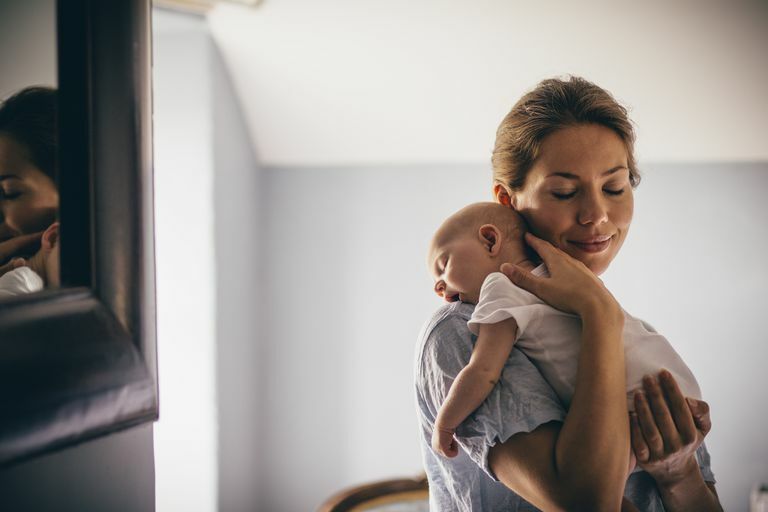 Before treating your infant's acid reflux, make sure to consult her doctor and get an accurate diagnosis of acid reflux as well as recommendations for treatment. Your baby's doctor will also be able to rule out other disorders with similar symptoms. Learn the symptoms of acid reflux in infants. Reflux can occur normal infants, but sometimes it is more serious. Your baby's doctor may decide no treatment is needed, because the reflux will disappear on its own as your baby grows older, resolving itself during the first year of life. If your baby is otherwise healthy and is growing, the doctor may recommend lifestyle changes in order to ease the reflux. If the reflux is more serious, the doctor may prescribe medication to help treat the reflux. It is very important to discuss treatment options with your baby's doctor before beginning any treatment method, especially before using any over-the-counter remedy. Keep infants upright during feedings and for at least 30 minutes after feedings. This will decrease the amount of gastric reflux your baby experiences. Feedings every two to three hours when the infant is awake will reduce the occurrence of gastric reflux. Overfeeding can increase abdominal pressure, which can lead to gastric reflux. This can reduce the amount an infant will regurgitate. Start with one teaspoon of rice cereal to each ounce of formula. If the baby is breastfed, try pumping and then adding rice cereal to the breast milk. Make sure to consult your baby's doctor before adding solids, including rice cereal, to your baby's diet. Certain foods, such as caffeine, chocolate, and garlic, can promote reflux, so if you breastfeed your infant, you should consider cutting these foods out of your diet. Burping your infant several times during the feeding will help minimize gastric pressure and the reflux it can cause. Waiting to burp your infant until after she has a full stomach can increase the chances of regurgitation. As noted above, position your infant on his back, and elevate the head of the bed 30 degrees. Gravity will help keep the stomach contents where they belong. The way your infant is positioned in the car seat can cause regurgitation to increase. If your infant slouches over, it causes abdominal compression, increasing the risk of reflux. Using simple supports to keep the infant upright will prevent this. Your baby's doctor may prescribe acid blockers, also known as H2 blockers, which block acid production in the stomach. These include Tagamet, Pepcid, Zantac, and Axid. Your baby's doctor may prescribe acid suppressors, also known as Proton Pump Inhibitors (PPIs), which can completely block acid production in the stomach. Prilosec and Prevacid have been approved for children older than certain ages. Gastroesophageal Reflux in Children and Adolescents." NIH Publication No. 06–5418 August 2006. National Digestive Diseases Information Clearinghouse (NDDIC). 29 Dec 2008. Heartburn, Gastroesophageal Reflux (GER), and Gastroesophageal Reflux Disease (GERD)." NIH Publication No. 07–0882 May 2007. National Digestive Diseases Information Clearinghouse (NDDIC). 18 Mar 2008. COMMON GASTROINTESTINAL PROBLEMS IN PEDIATRIC PATIENTS." American College of Gastroenterology. 18 Mar 2008.